“Mot, Hai, Ba, Dzo!”. This is the ubiquitous phrase for “1,2,3, Cheers!” in Vietnamese. If you’re at a party, Vietnamese wedding, or just enjoying dinner at a local restaurant, you’ll without a doubt hear this famous phrase yelled out repeatedly. While travelling in Vietnam and meeting the locals, it’s often a sign of friendship when offered a small shot of rice wine. Be careful, because this stuff can be dangerously strong! Most commonly, people are yelling out their cheers and clinking together mugs of beer with ice or small glasses of Vietnamese rice wine. 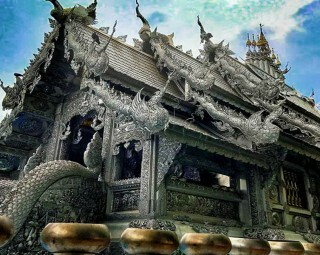 The latter of the two is deeply intertwined in Vietnamese history and culture. Vietnam’s rice production is massive, and the economy is very dependant on it. You can find at least one ingredient in most Vietnamese dishes that comes from rice, like My Quang noodles or Banh Dap Rice crackers. So it comes to no surprise that the locals have found a way to turn this major crop into alcohol. 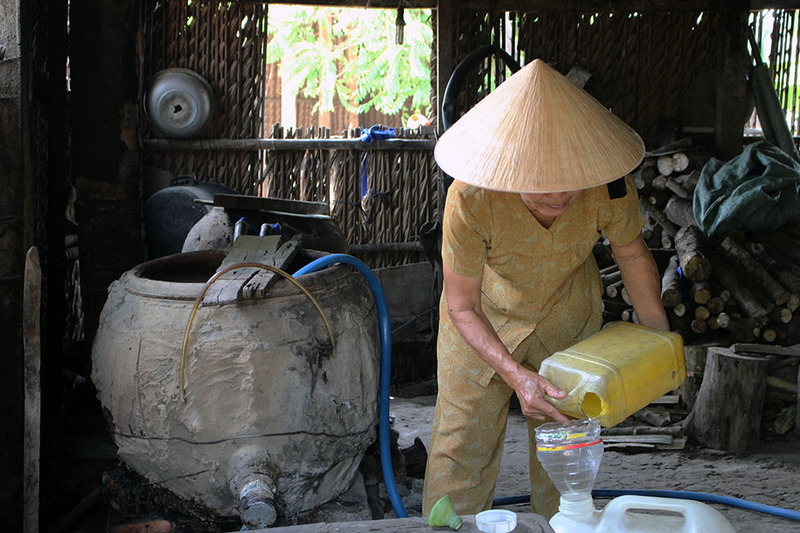 Hoang has been making rice wine for 34 years and has perfected her craft. 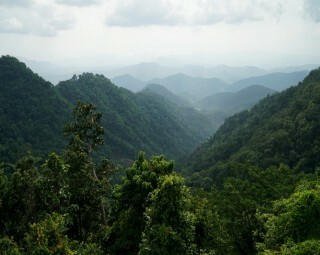 Her parents were rice wine distillers, and so were her grandparents. It’s been in her family for generations, and she will pass it on to future generations, keeping the tradition strong. The distilling process is more difficult than you may expect. 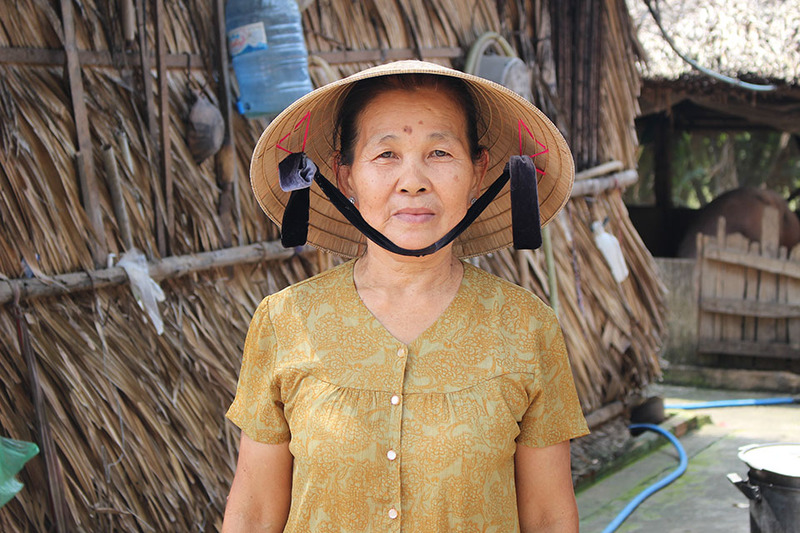 Hoang wakes up at 4:00am to begin cooking sticky rice, which has been harvested by the vibrant rice paddies surrounding her house in the marvellous Mekong Delta. After cooking sticky rice, Hoang lays the clumps of grain on a tray made from thatched palm leaves to cool. 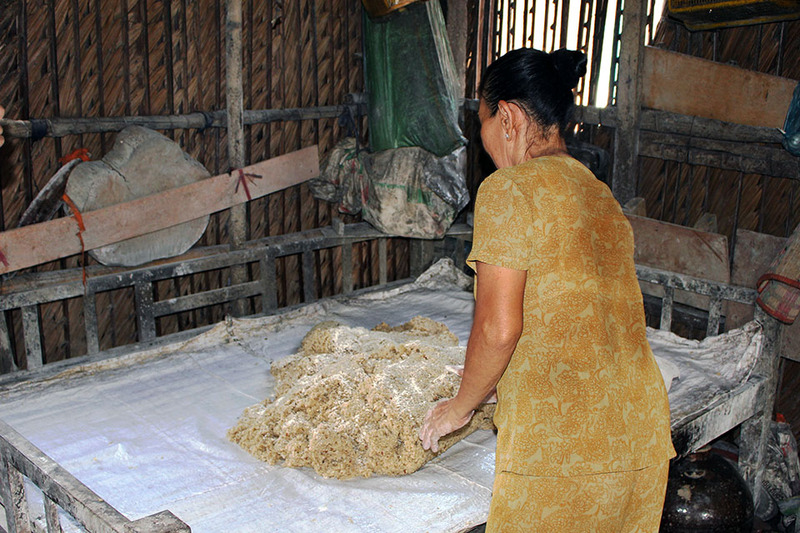 Once cool, Hoang sprinkles yeast on the rice and begins to mix the ingredients with her bare hands. Immediately, a sweet yeast smell arises from the cooling tray. After being thoroughly mixed, the rice is transferred into clay pots. These clay pots function as homes to the rice for the next 3 days to allow fermentation. Once 3 days have passed, it’s time to add water & transfer to a giant pot to begin the cooking process. The end result is (very) potent rice wine. Perhaps the most intriguing part of witnessing the rice wine distilling process is the fact that it’s almost zero-waste. The small husks from the rice are dried and used as fuel for the fire, along with small chunks of wood to ensure the perfect temperature. 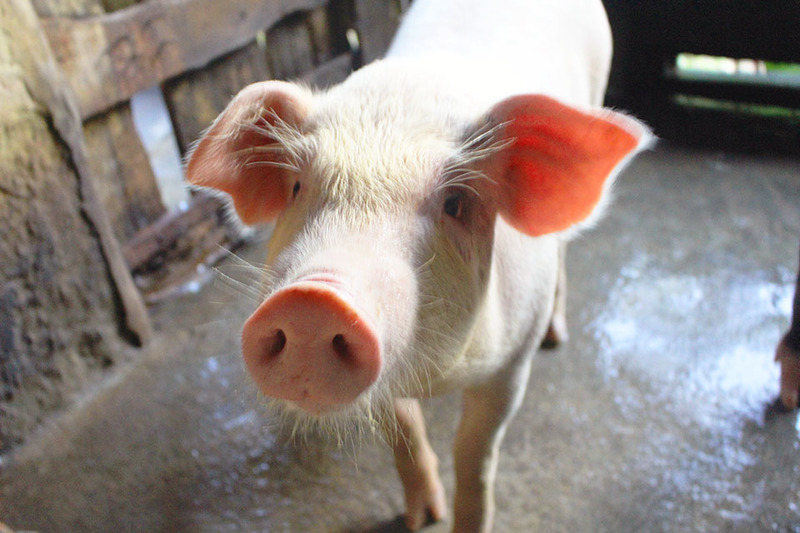 Most rice wine distilleries in Vietnam are in people’s homes, and you’ll notice that they almost always have a back area full of pigs, both large and small. This is because after the distilling process is complete, there is an abundance of used rice. This used rice isn’t served at a dinner table, but instead is fed to the pigs. If you see this firsthand, you’ll notice the pigs are extremely happy & lazy- they’ve gotten a little buzz! You’ll also notice that the pigs are extremely clean. Believe it or not, this ties into the rice wine distilling too. Owners, like Hoang, frequently clean the pig pens so that all of their feces are collected into one area. 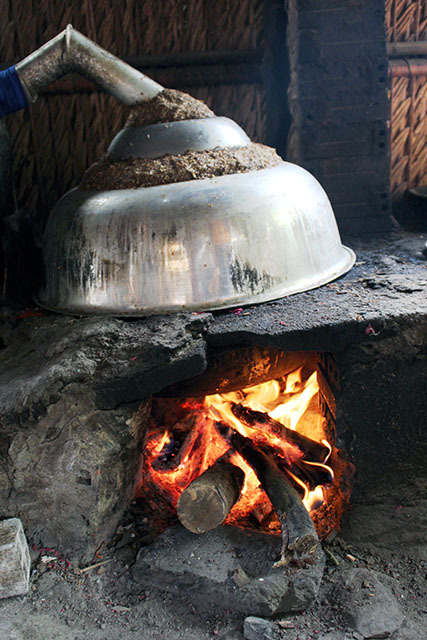 The feces then produces a large amount of gas which is collected into a bag and fuels the fire- which then cooks the rice wine. Pretty amazing, right? So, you may be thinking- this super strong alcohol can’t taste very good can it? Well there’s different percentages of alchohol depending on the batch. 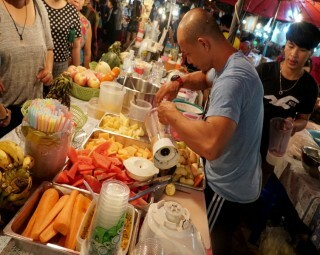 If you’re looking for something sweeter, it’s common for the locals to infuse their rice wine with a variety of herbs such as lemongrass, ginger and honey, or even traditional Chinese medicinal herbs. It’s really delicious, and a must-try when travelling in Vietnam. Want to meet Hoang? 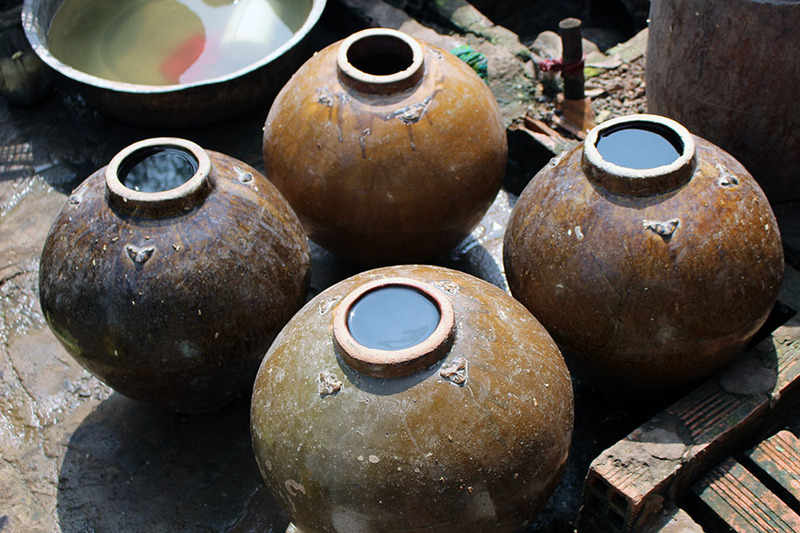 Check out our Mekong Delta tour, or meet another distiller on our Hoi An day tour.